By Elgin. Black dial with Arabic numerals. Luminous hands, numerals and chapter ring. 16-jewel 'hack' lever escapement movement. The 'waterproof' case is generally good but does have some scratching and general wear. The dial and hands are very good and the crystal has only minor scratches. 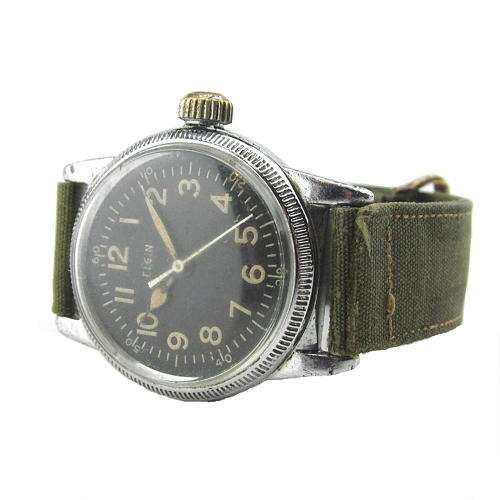 Fitted with what appears to be a new old stock olive drab fabric strap, this is in reasonably good condition. The watch case has AAF markings to the rear although these are relatively faint. The movement and 'hack' facility appear to be in very good working order and the watch is keeping good time. Stock code C22055.